The feature of chatting has been a great technique of helping customers about different technical problems. It can not only be a way to help customers, but customers can themselves use this feature in order to enhance communication with their visitors and members. Consider the situation where a movie promo website plans to organize a pre screening question-answer meeting between the producer and the fans of the movie, just a few days before the movie hits the red carpet. It would be a great way to create some sensation. Also consider a situation where an author promotes his new work on his website and reaches his fans using just a chat window. Nowadays, chatting is no longer restricted to provide support to your customers. It has taken longer strides, helping in establishing communities on the web. The WordPress Chat Plugin completely eases out the task by providing login support through Facebook as well as Twitter. 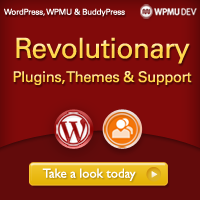 As a WPMU DEV member you can access all the plugins and upgrades, and you will also get support for emoticons and avatars, and also logs for review as the administrator. And, if your client or you want to use chat on a site, the plugin will allow you to accomplish this task.